What is your Disney Dream? The "Year of a Million Dreams" is Disney's latest promotion. The year long celebration began on October 1, 2006 at the Walt Disney World Resort in Florida and the Disneyland Resort in California. Disney Cast Members will be awarding a million dreams to randomly chosen guests as part of this new "Disney Dreams Giveaway" promotion. Many of these dreams are priceless experiences. In describing this event, Jay Rasulo, chairman of Disney Parks, stated "Disney parks are always the place where dreams come true - but even more so during the 'Year of a Million Dreams.' "
Ever imagine having the Magic Kingdom to yourself? The winners of this prize, the Spangler family from Ohio, did just that. These lucky VIPs toured each land and enjoyed the attractions as the Disney characters greeted them. The Spangler's were interviewed on Good Morning America and dined with Disney "royalty." 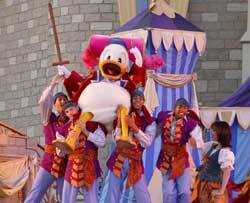 They also served as the Grand Marshal of the daily parade and concluded their day with a special viewing of Wishes. No doubt one of the most coveted awards will be a one night stay in the royal bedchamber being constructed inside Cinderella's Castle in Disney World. A comparable Mickey Mouse Penthouse at the Disneyland Hotel will immerse the lucky guest in Mickey decor with spectacular views of the Disneyland and California Adventure theme parks. 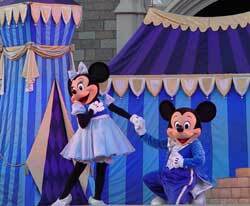 The new stage show at Cinderella's Castle is called "Dream Along With Mickey". Mickey and some of your favorite characters will be there to dream along with Mickey, with a few Disney Villains intent on spoiling the show. Disney Dreams Come True Parade - New songs and dances have been added to the Magic Kingdom's daily parade, but it appears they simply recycled the floats. The Seas with Nemo & Friends - In Epcot, climb into your "clam-mobile" and join with Nemo's friends in a search for this wayward clownfish. Main Street Family Fun Day Parade - Taking place in the Magic Kingdom, this daily parade features unprecedented guest participation. The Laugh Floor Comedy Club - In the Magic Kingdom those mischievous characters from Monsters, Inc. take you on an interactive adventure. Opening in 2007. Rockin' Space Mountain - Starting on January 3 thru April 16, a new soundtrack will be added to this popular attraction. This celestial concert will have you 'rockin' thru space. Combined with new lighting and special effects, Space Mountain will be a real "rockin' rocket ride". California Screamin' - As you're screamin' you'll be rocking with a brand new soundtrack that sets every twist and turn to music. Every loop and drop of California Screamin' will be accompanied by some great rock 'n' roll tunes. Paradise Pier is going to be a lot more lively starting in Spring of 2007. Stay tuned to the DIS as more details are announced. Note that opening dates are subject to change. Three Disney Vacation Club memberships at Saratoga Springs Resort and Spa or another Disney Vacation Club Resort as chosen by Disney. 220 points will be awarded. Fifteen 4 day/3 night Vacations at Walt Disney World including admission and $75 per day per guest to be used for dining. Fifteen 4 day/3 night Vacations at Disneyland including admission and $75 per day per guest to be used for dining.